The fresher the pumpkin you bring home, the longer your jack o’lantern will last. This is one of the reasons I’ve strayed away from purchasing my carving pumpkins at the grocery store and opted instead for pumpkins from a pick-your-own patch. However, even at the farm, not all pumpkins have the same shelf life. There are a few telltale signs of a healthy pumpkin you should look for this fall. Pumpkins with lighter orange skin are easier to carve because the skin is not a hard as the darker orange pumpkins. However, the darker orange pumpkins have tougher skin and will last longer. You can tell how healthy the pumpkin is by looking at its stem. A strong sturdy stem is a good sign of a healthy pumpkin, whereas a brittle, thin stem that breaks off or no stem at all can indicate that the pumpkin was stressed for water and nutrients. 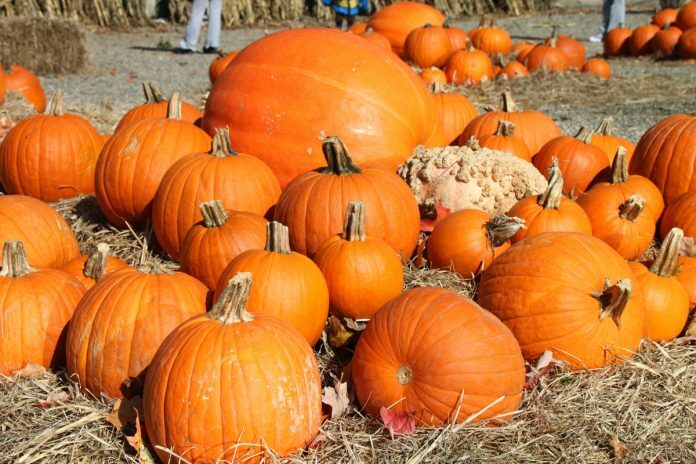 Pumpkins without a stem won’t last long and those with soft stems may have already started to rot. Always make sure to inspect the bottom of your pumpkin before taking it home. You want to avoid pumpkins with soft bottoms as it’s an indicator of early rot. You should also be sure to select a pumpkin with a flat bottom, so your jack o’lantern will stand upright.